I've made the comparison before: Without Pantera, no The Burning. This is still the case. Crossover thrash from the end-eighties/begin-nineties also has to be mentioned when you describe the music of the four Danes. And this is not a bad thing! Not for me, anyway. 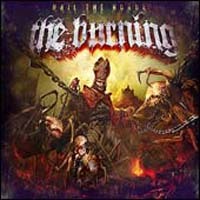 With every release, The Burning seem to be able to make things a tad more interesting. 'Hail the Horde' holds a couple of nice surprises, the biggest probably being the clean vocal of Nico Adamsen from Artillery on the very cool and slightly Priest inspired track Wolf Moon. New kid and former Dawn of Demise man Alex on the guitar seems to be an asset for the band. Solid as a rock, nothing fancy, but groovy and varied style, fits right in. I might as well note here that Alex's former band mates Scott and Bjorn make a guest appearance on the title track of 'Hail the Horde'. Hammer track with an intro that has a real crossover feel and an abundance of death grunts. 'Solid' is a word that I have to repeat. I am convinced that we can expect a series of listen-worthy albums from this band over the next few years. They have a style that goes straight into the neck muscles. They have found their own expression without sounding exactly the same from album to album and that is a true strength. Get thy arse down to the nearest record store and purchase a copy.